Religion: Streamlined from Here I Stand, the new rules for religious conversion and rebellion allow actions to be resolved quickly, reflecting the already entrenched presence of both Catholic and Protestant factions across the key areas of religious struggle. World Map: Oceanic expeditions are now under direct player control as they sail to the Caribbean and beyond to seize plunder, found colonies, and attempt to circumnavigate the globe. Weddings: Here I Stand’s secret negotiation phase is still present here in Virgin Queen, but with a new twist. Now you will want to arrange marriages for each of the princes and princesses of your family dynasty with a suitable foreign royal. Will even the Virgin Queen succumb to love and take a husband, or will she jilt that suitor at the last minute once again? Patronage: Your royal court will be visited by artists, writers, scientists, and architects, who all want you to invest in their endeavors for the glory and advancement of the realm. Will you sponsor Galileo, Cervantes, or Shakespeare or instead spend your treasury on a fruitless quest for the Philosopher’s Stone? Espionage: Beware, there is also a dark side to this period -- a time of espionage and spymasters. 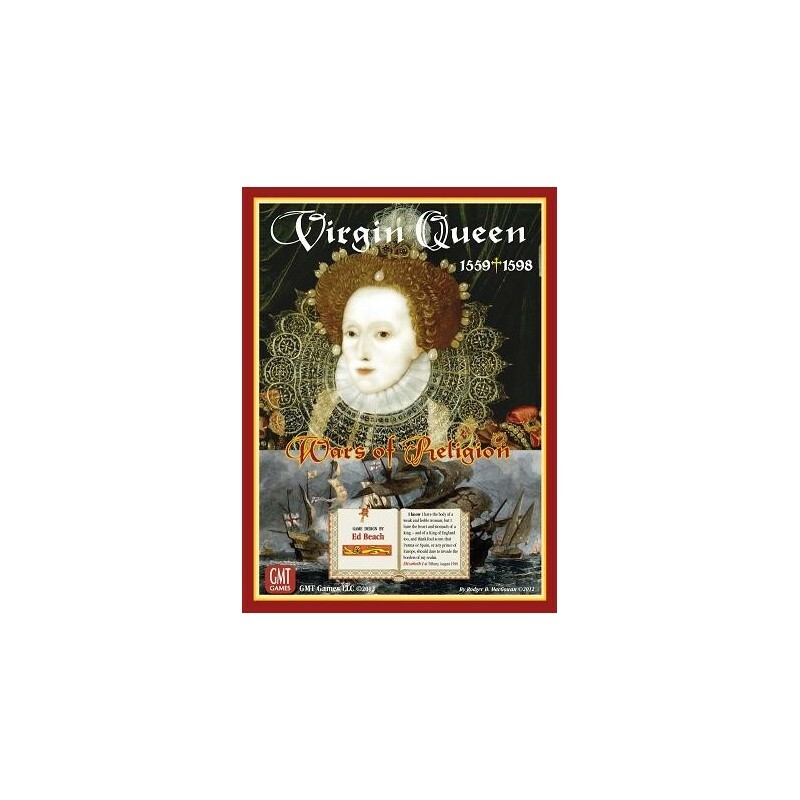 In Virgin Queen you can ask your ambassadors to spy on foreign courts, send out handgun-armed assassins, invest in cryptology, and even recruit Jesuit priests for undercover missions of conversion. 2-Player Tutorial: Great for new players just learning the series, this 90-minute game pits the Ottomans against Spain during the time of the Siege of Malta and Battle of Lepanto. Uses a subset of the full rules so you can dive in quickly. 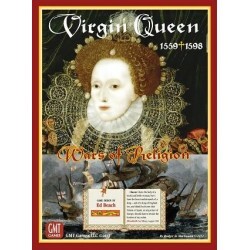 Campaign Scenario: The full Virgin Queen experience, this 8-hour game can last up to 7 turns and is normally played with from 4 to 6 players. Variant rules allow you to play with just 2 or 3 players if desired. Armada Scenario: A quicker game focused on Turns 3 to 6 of the full campaign, this 4 to 5-hour game is ideal for tournament play. Once again supports from 4 to 6 players. wargame diplomatique multijoueur sur les guerres de la réforme. réédition 2010 comprenant une boite plus grande, des pions plus épais, une carte rigide et les cartes et variantes pour deux joueurs.